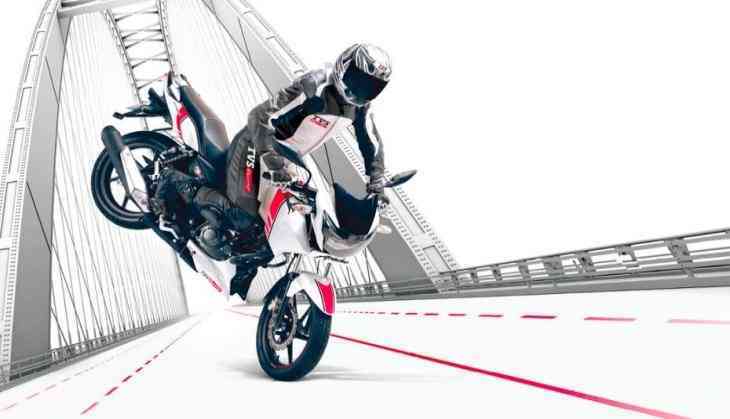 TVS motor company has launched the race edition of its popular bike RTR 180. The ex-showroom price of this edition will be Rs 83, 233. TVS has given beautiful look to this bike with purple-white colour and race-inspired graphics. If we talk about the break, the company has studded the updated model of Apache RTR 180 with disc breaks in both wheels, which is coming in every bike of this model. Apart from it, this bike has been updated with several other features. In these new features, 3D TVs logo has been placed on the fuel tank, which looks attractive. TVS motor company has developed this new bike with carbon fibres part. Parts alongside the fuel tank in race edition RTR 180 has been made of carbon fibre. This bike has been studded with completely digital instrument console which comes with the blue colour light. The instrument console display will show speed, lap timer, 0-60 km/hr speed recorder along with service indicator. In India, the biggest competitor of RTR 180 will be Bajaj Pulsar 180. If we talk about the power of TVS Apache RTR 180 race edition then the company has featured the regular engine in this model. Apache RTR 180 has the single cylinder of 177.45cc which can produce the 8500 rpm with 16.4 bhp power and 6500 rpm with 15.5 Nm it can generate the peak torque. This bike reaches the speed of 0-60 km/hr in less than 5 seconds. The company has claimed that this bike is the most powerful bike in 180 segments.